Dads do shoulder an extremely heavy responsibility in the family – not only are they traditionally the primary bread winner of the family, dads too, will have to be the DIY handyman around the house, making sure that whatever needs to be fixed will get fixed, not to mention looking out for monsters underneath the bed and soothing their child’s cry whenever one falls down and scrapes a knee. In their general quest for being the all-rounder of the family, dads too, are sometimes thrown into situations where they need to look for something in the middle of the night. 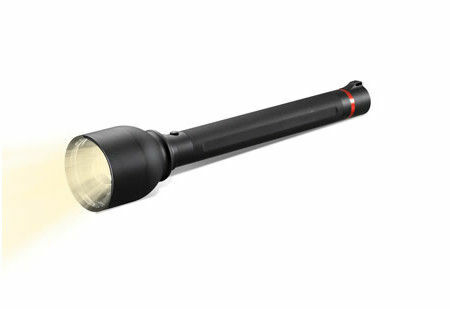 This is where a decent flashlight will come in handy, so why not go the whole nine yards with the $249.95 Law Enforcement Flashlight? The name itself does lend a story that this is one particular flashlight that is preferred by law enforcement personnel as well as search and rescue operators, thanks to its superb performance ability that enables it to cast a cone of light up to 2,240 feet. It will make use of a powerful LED bulb, where at its highest output of 1,132 lumens, the flashlight’s beam will have the ability to illuminate subjects with a 3’-diameter spotlight at its farthest range. This is ideal to take note of a landmark, and you can also choose a low output setting of 95 lumens to cast a broad, 30’-diameter beam up to 600’ for illuminating wider areas. A quartet of D batteries will offer relevant juice for up to 4.5 hours of operation at its highest output setting, and it comes accompanied by a rugged EVA carrying case and shoulder strap. This is definitely far better than other puny flashlights on the market, but it might find a worthy rival in the Apollo A1.